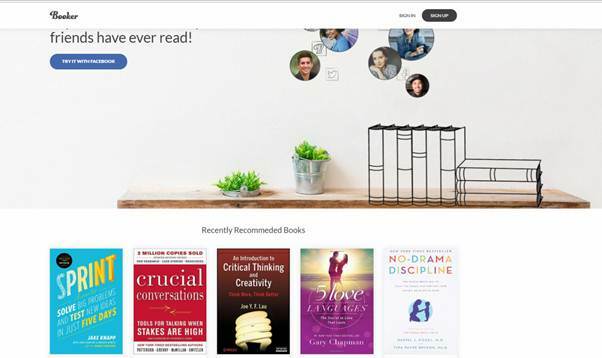 Booker.io is an excellent book discovery platform for avid readers, writers and bookworms. Booker was launched in Sep 2017 and Dr Adrienne Matheson is the co-founder of Booker, who is a clinical psychologist, focused mainly on families and Children. After years of giving book recommendations to her patients, Adrienne decided to use her knowledge in building the Booker.io platform as an innovative tool for sharing interesting books which are worth reading. Booker is an amazing and easy-to-use book discovery platform which leverages social media networks to find and share interesting books which are curated by our close friends and people we trust. This includes your Facebook friends and people you follow on Twitter. Booker will capture the 9 must-read books for everyone and will share it with rest of the world. Booker will also display the Top Bookers every week that you can follow if you wish to find more interesting book suggestions from them. Discovering useful books Online can be a tedious task as you may run into some junk and annoying book ads, fake and made-up book reviews which may not be worth your time. People don’t have enough time to search for the quality books they like and end up asking for recommendations from friends and people they trust. By leveraging modern social media platforms, Booker.io aims to solve this problem and improve the user experience in finding meaningful books online. Booker.io addresses the book discovery problem by using social networks to connect like-minded readers. It helps to create a community of readers through social media channels like Twitter and Facebook. You can instantly sign-up to Booker using your verified Twitter or Facebook account and then update the 9 must-read books. In a similar way, you can also get the recommendations for interesting books from your friends and other people you trust. Booker platform has a collection of the most useful and interesting books curated by your friends and people you follow on social media channels including your colleagues, leaders and celebrities. Booker has a powerful mission to create the biggest book discovery platform in the globe and works with a cause to help people find useful and meaningful books easily. It helps you to share your knowledge, perspectives and ideas amongst a community of like-minded readers. Booker values life-long reading and learning. One of the biggest advantages of Booker is that it is free to join for anyone and does not cost you a dime. You can join the community using your verified Twitter or Facebook account and instantly get book suggestions from your close circle of friends and other like-minded readers.